The real life story of stocky, friendly-faced character actor Wallace Ford rivals any screenplay Hollywood ever wrote. Born Samuel Grundy Jones February 12, 1898, he was from the poorest of families of Bolton, Lancashire, England. At only three years old his aunt and uncle, who had a total of six children of their own, placed Samuel with the notorious “Dr.” Thomas Barnardo orphanage as a home child. With over 300 others he was sent to Toronto, Canada, at age seven. From 1868-1939 more than 100,000 children from 50 British orphanages were transported via steamship to Canada where they were settled with rural farming communities. The younger ones, three to five, were often adopted and grew up loved and happy, but many of the older children, from six to 17, were treated as chattel, enduring harsher conditions from which they had been “rescued” in the slums of Britain’s industrialized cities. Such was Samuel’s fate, rivaling the brutality of a Charles Dickens novel. Ford then quit his wanderings and found work in shoestring theatrical troupes and repertory companies. During WWI he served with the U.S. Cavalry at Fort Riley, KS. In 1919 Ford joined a dramatization of Booth Tarkington’s “Seventeen” which ran for nine months in Chicago and received a rousing reception in New York. Over seven succeeding Broadway plays followed in the ‘20s including the role of Abie in “Abie’s Irish Rose”. His inauspicious feature film debut was in the baseball drama “Swellhead”, made in ‘30 but not released until ‘35. His big break came in ‘31 with Joan Crawford’s “Possessed”. He then landed the lead in MGM’s now cult classic “Freaks” (‘32) and was Walter Huston’s amoral brother in the gangster drama “Beast of the City”. 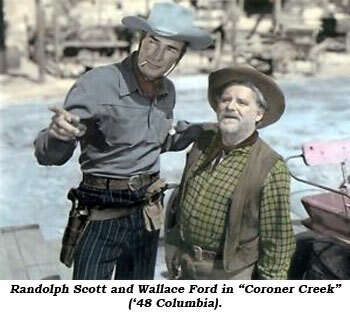 Ford then starred, or co-starred, in scores of B-mysteries, often as a wisecracking newspaper reporter (“Headline Shooter”, “Night of Terror”, “Mysterious Mr. Wong”, “Nut Farm”, “One Frightened Night”, “Rogue’s Tavern”, “Mummy’s Hand”, “Mummy’s Tomb”, “Ape Man”, “Machine Gun Mama”, “Roar of the Press”, etc.). Also among Wally’s over 160 films are five directed by John Ford, including “The Lost Patrol” (‘34) and “The Informer” (‘35). He often returned to the Broadway stage; in ‘37 he created the role of George in the original production of “Of Mice and Men”. As he grew older and stockier Ford remained in demand for middle aged character roles, eventually sporting a short-cropped white beard. 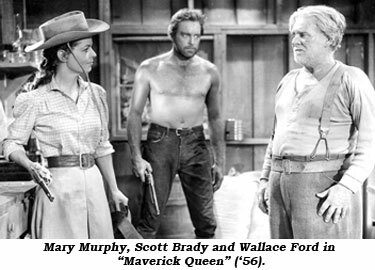 (‘50), “Warpath” (‘51), “Great Jesse James Raid” (‘53), “Nebraskan” (‘53), “Destry” (‘54), “Wichita” (‘55), “Man From Laramie” (‘55), “A Lawless Street” (‘55), “Maverick Queen” (‘56), “Stagecoach to Fury” (‘56), “Warlock” (‘59), among others. 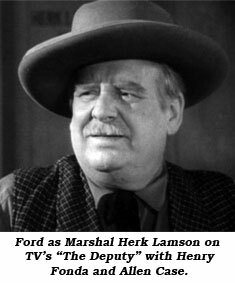 No stranger to TV he appeared on “Death Valley Days”, “Trackdown”, “Tales of Wells Fargo”, “Klondike”, “Wide Country”, “Travels of Jamie McPheeters” and in ‘59-‘60 Ford joined old friend Henry Fonda in the first season of “The Deputy” as Marshal Herk Lamson. In July ‘43 Ford acquired his U.S. citizenship papers and also had his name legalized as Wallace Ford. Ford met his wife, Martha Haworth (sister of actor Joe Haworth during the run of “Abie’s Irish Rose” on Broadway. She was in the chorus; they were married in 1922 and had one daughter, Patricia, born in 1927, who died in 2005.